Hello! I hope you're having a great week so far! 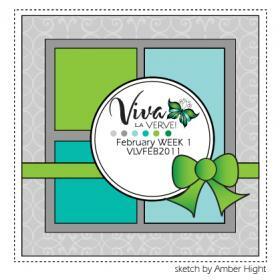 I made this card using the first Viva la Verve sketch for February! You can find all details here in the Verve Splitcoast forum. I started by pulling out some coordinating patterned paper from the My Mind's Eye Fine & Dandy Tickled Pink collection, layered and stitched them together. I used Verve's Happy Hello (currently on sale!) to stamp the circle frame and sentiment, then I used a circle punch. I popped this little frame on top of a round yo-yo that I made out of some Moda fabric. I finished it off simply with a few pink rhinestones and some yummy Always Aqua baker's twine from Pizzazz Aplenty. Accessories: Circle punch (EK Success), Modern Garland border punch (Martha Stewart), Rhinestones, Always Aqua Baker's Twine (Pizzazz Aplenty); Fabric, Yo-Yo maker, Foam tape, Thread, Sewing machine. How soft and pretty Stephanie! Love the fabric yo-yo - it looks so soft! I wish I could touch it :) Fabulous! This is beautiful, Stephanie! Love the little stitched fabric behind the sentiment. Just beautiful! This is very pretty, I LOVE the colors and the patterns of the paper, along with the beautiful flower! Such a lovely card! I love the blue and pink together. I love your color combo here! Super sweet card! Very pretty card Stephanie! 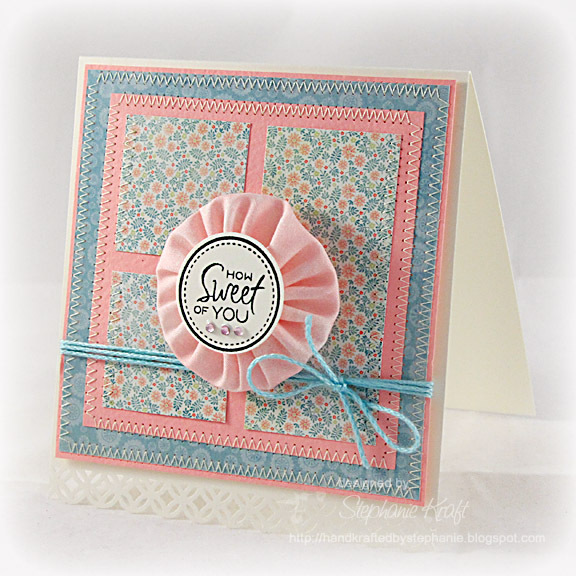 Love the soft color combo and pretty fabric embellishment! OOOOOH! This is GORGEOUS Stephanie!!! LOVE the layout, the clean look, the bottom border...GORGEOUS!!! Gorgeous colors and design as always. You are so good at pulling together a clean design with fabulous papers!